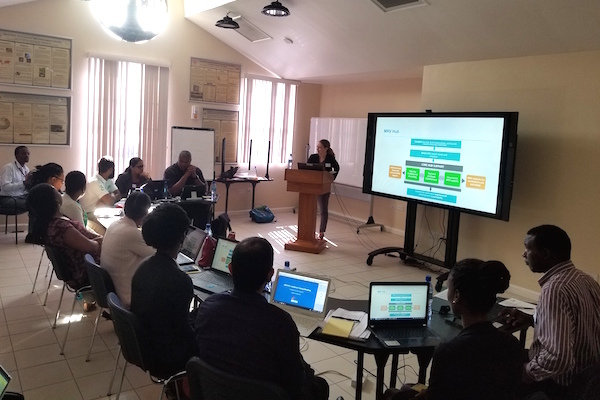 Nine individuals from 9 MRV Hub countries (Antigua and Barbuda, The Bahamas, Belize, Grenada, Guyana, Jamaica, St. Kitts and Nevis, Saint Lucia, and Trinidad and Tobago) and 4 additional individuals from the Caribbean region recently participated in the first MRV Hub Working Session in Grenada. The session provided participating country representatives an “Introduction to the 2006 Intergovernmental Panel on Climate Change (IPCC) Guidelines for National Greenhouse Gas Inventories”. The training was designed to equip participants with the basic knowledge and skills to improve the overall quality of measuring and reporting greenhouse gas emissions. The session was delivered as part of “Grenada Climate Week,” and organized alongside and in coordination with two other BMU-funded projects: the “Project for Advancing Climate Transparency” (WRI) and “Integrated Climate Change Adaptation Strategies in Grenada” (GIZ).